Order this exclusive Philadelphia Eagles Super Bowl LII Champions Commemorative Art Football and custom display case combination set! Protect your Eagles Super Bowl LII Championship Art Football with this beautiful glass display case, keeping it in great condition and for all to admire for years to come. Each football features the reproduced work of noted artist Jolene Jessie, and the display case includes a handsome wood base and crystal clear glass cover. Order yours today before they are gone. Every ball comes with a numbered certificate of authentication. 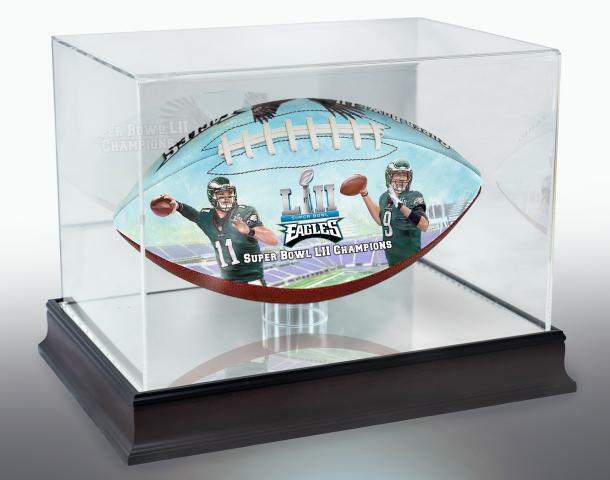 Eagles Super Bowl LII Champs Commemorative Art Football and Display Case $179.95 Sold Out!